Indonesian president Joko Widodo has revealed the country's intentions to bid for the 2032 Olympic and Paralympic Games. 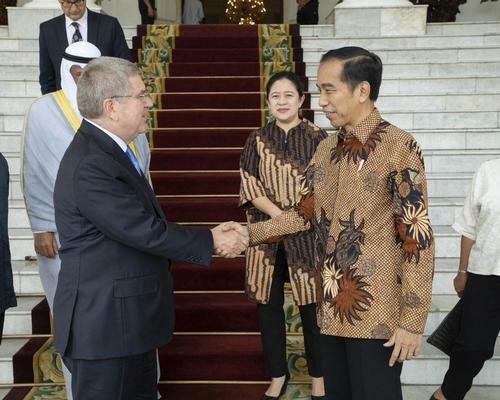 The announcement was made following a meeting between Widodo and International Olympic Committee (IOC) president Thomas Bach over the weekend. Last month, Indonesia held the Asian Games – which Widodo said would provide a 'strong foundation' for the country's 2032 bid. The event saw around 12,000 athletes take part, representing nearly 50 nations and territories. Indonesia is the first country to have officially declared its intention to bid for the 2032 Olympic Games. Tokyo is hosting the 2020 Olympics with Paris and Los Angeles already selected to host the following two Games in 2024 and 2028. IOC president Bach welcomed the candidacy and seconded Widodo's view that organising a multi-sports event will benefit the preparation of a bid. "With the great success of the Asian Games, Indonesia has shown that they have all the ingredients to hold the Olympics successfully," said Bach.